Welcome to another "Friday's Tip of the Day"! For today, I decided to touch on "punches"! Which I know alot of us have several punches that we don't even use & I will show you a simple way on how to utilize them more on a regular basis! Hope these tips help you out some! Here is the card I made using my 1 1/4" square punch! I actually LOVE the way it came out! All of the sentiments used are from my stamp set "All Star Baby"! That little clear charm that you see w/the cutie baby feet in are called "Facets" by Tim Holtz! They are available @ Peachy Keen Stamps which you can find HERE! Here is my video featuring my method on how I utilize my punches more & storing my punches! A special "Surprise" giveaway! For an opportunity to win this AWESOME "Modern Label Punch", all you have to do is leave a comment HERE telling me how "YOU" store your punches & if you have any tips you would like to share, I would LOVE to hear them! GOOD LUCK! I found a canvas organizer that hangs from a curtain rod in my craft room. It has two columns of cubbies, one large, about 11x11 and the other smaller, just the size for plastic shoe boxes. The organizer came with several canvas boxes that slide right into their cubbies, but my punches are in one of the plastic shoeboxes I added. Very usable, not terrible expensive. I store my MS punches in a plastic container that I brought in wally world I also label them with my label maker thank you for that chance to play. Great video and I love that tip with the templates. Think I may do that. I store the majority of my punches in 2 clear over-the -door shoe bags/organizer. One hangs in my "craft closet" and the other over my craft room door.They are clear so you can see what you have at a glance, they take up space that normally would go unused and they are relatively cheap. The large MS punches sit on a shelf in my craft closet. Works well for me. Thanks for all you do Emma! My punch storage is horrible!!! I have some baskets, I throw them in and put baskets on shelves.... Keeps them together but that's about the end of the pros to this method. I put them in a drawer... It's a mess!!! HI I store my punches in a clear tub. I love your videos keep them coming. Very cute card! I just store my punches on top of a massive box of ribbon. I need to come up with a better system! Super cute card ~ love the facets. I store my large (& border) punches in baskets and have a peg board on the wall with bars on it to hold my smaller punches. Thanks for the give-a-way Emma! Love the card - what a great idea to use punches. I store all my punches in a drawer, which isn't very practical cause I can't see the small ones that fall to the bottom. Oh well. Such a cute card...love it! Love the template tip. My punches are all in a basket next to my craft table....looks messy but works for me!! Such a cute card. I could have used this card sketch when 6...yes...6 teachers were pregnant and having baby showers this year!! All of my punches...all 5 of them (one is MIA) are on my desk in a cluttered fashion. I'm loving the suggestions other people are leaving. Love that modern punch, too!! My dear Hubby made me 3 shelves that sit over the window and my Marthda Stewart, Stampin up and EK Success punces sit on it so I can see them and they are at my fingertips. Love your blog. Really good tip, I have very few punches they all fit in a drawer but are visable and close to my work area. The card is darling, the sheer ribbon was a great choice. Thanks for the "give-a-way" I would love to add it to my small collection. Hello Emma! Thanks for the great video tip! I luv the template idea, and will use this. I store my punches on top of my stamp sets that go with them on a shelf. Hope your foot feels better soon! Hi Emma! I love your punched card! It is quite lovely. I store my punches in a bin and haven't really used them much. I may have to play with them now! i store my punches in clear plastic containers, but i'm still looking for a better system. I store my punches in a drawer of my desk! It aggravates me to have to sort through them looking for one to fit...I am totally going to use your idea! Emma, that turned out so cute! I love the stamps going across the little squares. Great idea! Super card Emma, Thanks for becoming a follower. It was great meeting you at the circle crop also. I store my punches wherever I used them last. I store them in a plastic set of drawers that is on rollers in a the closet of my art studio- and some are on a bookshelf, I don't have a lot of punches. Hi Emma! Thanks for the chance to win. I don't have but literally a handful of punches. Therefore, the time being, they are sitting on a shelf I have in my craft room/guest room. With your punch templates I have something similar for Cricut basic shapes. I put them on 8.5x11 paper and loaded it into my cricut and put the sizes of my circles, squares, etc on there and I then laminated it. However, after watching your video, I think I will make an album for them to be stored in. And just use binder rings to hold the album together, that way they can be expanded :) bought some binder rings at Walmart because I made a little book of card sizes and instructions on how to do them. Then I will put a picture of the card on the page so I know what type I want to do! Thanks so much again! Have a great weekend! I store my punches in a plastic container. Not organized or labeled ( a mess!) LOL. When your foot is feeling a lot better; Please do a tutorial on the ribbon technique you did on Thursday's card. It was soo pretty. What a cute card. I love the punch tips you gave. I store my punches in one drawer. I don't have too many yet, but I like the idea of the paper you gave and think I will try that along with doing the same with my stamps so I can open a notebook and see them all at a glance. Thanks for sharing and for the chance at the give away. I look forward to many more tips. I do not have a big assortment of punches because I am just starting my collection. The ones that I do have fit in a small 5 in. x 5 in. plastic container. A very nice baby card. I like your template idea, must try it. As for my punches I keep them (nearly not the amount you have) in a plastic container. No organization at all. Thanks for sharing and the video. Unfortunately, I don't have any great ideas on how to store my punches....they are all piled up in several drawers. I AM getting some great ideas from reading everyone else's storage ideas here. Thanks for the chance to win! Thanks Emma! I store the few that I have in a clear shoe box container. Thanks for the chance to win. Great Video as usual Emma. Love watching your videos so inspiring. Originally stored my punches in a big drawer but got to heavy, now store in plastic containers with attached lid from wally world categorized by brand per container. My craft room was originally the game room in my basement so has rock walls. Pool table (Covered with a tarp, regulation size so is huge) makes a fantastic work space. Thanks for the chance to win another awesome punch and for sharing your talent. I absolutely adore your card. The little charm against the "tiled" sentiment is phenomenal. I just recently and getting into using punches, so I really don't "store" them. They just sit in their own spot on my craft table. I have labeled them with tape so I can tell others what I have used in my projects. I look forward to seeing what others have to say about their storage tips, though! I love this!!!! What a great idea. I don't have many punches, but those I do have I store in a drawer. I only have one punch, so I don't have a storage system yet :D I love your card though... might have to go get a new punch now! I have my punches in one of those rubbermaid drawer units.I tend to only buy them when i have a 50% coupon for Michaels though as they can be so expensive! I store my punches in a shoe door hanger, except it is hung on the wall. Leave plenty of room for my stamps and more room for my other craft items. Besides with a clear view I can figure out which ones I am looking for in a hurry. Great tip and thanks for the giveaway. Happy Father's Day to your Hubby! ooops...I watched finished watching your video after I made a comment...sigh..I just put all of my punches in drawers. Now, Thanks to your wonderful tip I can organize them and label my drawers, and keep a folder of the punch outs on the top of the dresser!YEAH!!!! glanning@msn.com... ...HUGS! I store my punches in a shoee door rck. It has worked perfectly up until now...I seem to be purchasing more punches and therefore am running out of room. I've got to come up with a new storage solution. Thanks for the opportunity to win. I store all my punches in a Creative Memories box. I punched each shape on card stock and laminated them individually. Then I made a hole on each laminated shape, put an eyelet on each hole, and keep all my shapes on a big ring that I have hanging from my scrap room wall. Love this idea Emma! Will be using it for sure. I only have a few punches, so mine are stored in a drawer. Thanks for sharing and chance to win! I purchased a DVD cabinet that has adjustable shelves. Because the thelves are adjustable I can store punches, cricut cartridges, ink pads, big shot dies and stamps in clear DVD cases. The glass front make it easy to see everything. I love the way you punched them all out! Fabulous idea! I don't have any tips and tricks. Mine are all stored in a plastic bin. I need help!! Love how your card turned out! I don't have too many punches, but the few that I have, I simply store in a container with some of my wood block stamps and inkpads that has a lid. Thanks for sharing yoru talent with all of us! I put my punches in a Sterilte plastic container that has a clear drawer so I can see my punches and is easy to access. The punch you are giving away is great and i don't own it. I just keep my punches in a drawer. I try not to buy to many,just my favorites and use the cricut to cut most things out. Great tip and I love this card! I have done that in a long time so now I have a new project! TFS. Great idea on using the sheets with the punches as a template/guide for us as you do your project. I store my punches in a similar type plastic multiple drawer that's next to me and it actually fits right under my table so they're always within arms length. I don't have as many as you do though but I'm working on it. Hi, Emma, I don't have too many punches; so, I store them on a bookcase shelf where I can see what I have. Thanks for sharing your ideas, videos, and talents with us. Emma, Love your Friday tip video's! I have a drawer that I store all my punches in, but I like your idea also. TFS! I don't have many punches, so they all fit in one drawer in my scrapbook cart. Thanks for sharing your ideas too. Presently, I only have a handful of punches. They are currently stored in a large Tupperware container! Thanks for the great tip & the chance to win this awesome punch!! Thanks so much for this opportunity!!! I use an over-the-door shoe hanger to store my punches. I try keep all the similar ones together. I have one on the closet door and I need to get another one for the door into the room. To keep them from flopping every time I open the door, I used 2 pieces of 1.5 inch ribbon and tied one piece around the top of the bottom row and the other just below the bottom of the top row (hope that makes sense). Great idea. Love Love Love it. Right now they are all in a draw. With the cut out forms it will be very useful. Thanks so much for a great idea. Hi Emma! I store my punches on a CD shelf, but I am outgrowing that, so gotta come up with something new! I love the idea of the templates--very useful! Thanks for the video. I am just a beginner and have very few punches so they sit in their box for now. Thank you, thank you, thank you!!!! I was thinking of doing something similar but I love your idea so much better, I have a very large collection and seem to be using the same ones over and over. As for my punches they are in drawers for now. I don't have too many punches but the ones I do have I store them together in a small see through plastic tote with a cover. Love your tip about punching a sample sheet I need to try that. Thanks for the giveaway. What a great idea that you punch on paper all your punch shapes. I do not have very many punches. I store them in those covered craft boxes I bought at Michaels.Most of my punches are decorative for the edges. I think I'll try this idea of yours and see if I end up using my punches a little bit more. I like your card. I made a scrapbook page kind of like that. It didn't have any stamping on it but some of the squares were pictures and some were different patterned papers. Great Idea!! I don't have that many punches, but this technique will come handy. I have to admit my punches are in a box on a shelf in the closet that hosts the rest of the craft things.... but they do have their own box!! Thanks for a chance at the giveaway!!! I store in three plastic tubs that fit in a bookcase. One with circles and squares, one with edging and the third for others. I store my punches in a drawer of one of those 4 drawer things, and for the larger heart ones, I put them in a canvas storage thing that fits into my 9shelf organizer from target. I use my label maker to put the names/size of the punch. Some of the older stampin' up didn't label them so that helps me tell what size they are. I have only recently begun collecting punches, so for now they are stored in a couple of plastic drawers in my bookcase. I love that tip with the templates. I only have a few and right now they are still in boxes. We moved into a house not ready back in Oct. I still have yet to get the area I want set up for my scraping (want to help? Lol). I love all your ideas, I just don’t know where to start. Would like to get it set up, so I can start on my Daughter’s wedding from June 4th. Thank you for sharing. I store the punches I have on a shelf but I do not have that many I am collecting but it is a slow process. Love your project!! db.gallant@eastlink.ca if I am your winner. Thanks so much and have a wonderful weekend. I hope your foot is better very soon. I have a drawer that I purchased at Michael's (with coupon of course). I can't remember the brand, but I bought many different units that stack and hold scrapbooking supplies. I love it, but will definitely use your idea to keep a punch template handy!!! Thanks for all the tips! I store all my punches in a drawer. I do use them a lot. I know I will use your template idea. I have people come and work in my art room. The templates will help them know what is available. It will also help me. It such a great tip. Thanks! I keep them in an over-the-door shoe storage. Thanks for giving a chance to win. remind me to use them. I like the idea you shared. I just might do that also. I store my punches in a plastic container, however since I am still a newbie I don't have that many yet. I sure would like to win the modern label punch since that is one of my favorites also. Thanks for the tips and for showing us how you make those beautiful cards. I wish I could say that I have great, well organized method, but that wouldn't be true. I have quite a few EK Success border punches and they lined up very nicely in a drawer in my roller cart in two rows. But the rest are all odd sizes or the old lever style for which I've never really found a good storage solution so they are just tossed in a drawer. Well miss Emma, I keep my label punches stacked right on my desk, so I can get to them easily. They work so well with your sentiment stamps,I seem to use them all the time and I have been wanting that one for a long while. Thank you for a chance to win one. WOW...what an awesome give away!!! I LOVE punches...I am an addict...I too store mine in shoe holders that go over the door...One side of the door hold all my "precious" SU ones and the other side is all Other brands. I wish I had wall space to use the IKEA bigel rails to make them more visible. I loved your punch tip, so smart! I only have a few punches and I keep them in a plastic drawer (as part of a 3-drawer organizer, nothin' fancy! Thanks for all of the fantastic videos, tips and giveaways! I would love to win this punch! I've been wanting this one too! I tried storing my punches in an over-the-door shoe bag but they were too heavy and it sagged. (I have several hundred.) Then I found the Crop in Style Punch Pal. It is similar to the shoe bag but made much stronger, especially for punches. It has clear pockets, comes in two sizes for small and medium or medium and large punches. Three bags fit on one side of a door as they are made to hang from each other. The punches are very accessible and are in plain view on the door to my craft room. My larger border punches are in a drawer. love the card! i have never created a card like this.. hmmm. need to try! so simple but yet so cool!!! I store my punches since i have NO (tears a flowing) craft room but just shelves. I have the small boxes that creative memories sold (zippered black boxes) and i have them in there. I have about 5 boxes. Hey Emma, I store my punches in a little plant stand its about 2 feet tall and about 8 inches wide and has 3 shelves. I don't have very many, I love the template idea for the punchs. Your card was very sweet and cute. Hope you feel better soon! Hope you have a Blessed Day! I have my punches in a deep drawer in one if those tall plastic containers with 5 drawers in it, I love the idea of punching them on an example sheet! My most used punches sit on a shelf above my craft desk. The others are stored in a decorative box with a flip top (that I got at Michael's for 1/2 price! ), and that's stored on top of a bookshelf that holds my paper. Your give away punch is one that I don't have, so it would be GREAT to win! What a great card! Thanks for the many ideas and product reviews. I store my stamps in a drawer. have a great day. My punches are just thrown into plastic boxes which makes it very hard to find whichever punch I am looking for. I have a notebook of my punches where I have glued in the punched out piece, but this is only so I will know which punches I have when I go shopping. I like your idea much better. Thanks for all the tips. My punches are in a shoe holder hanging. and my ek success and ms punches are lined up on a desk. I like the idea of the card of punches. thanks I love your tips section. Oh Emma I love the sketch of this card! It is simply fabulous!!!! I store my punches on a wire shelving, they just kind of sit in between the wires. I've also seen them stored in like a shoe hanger with different compartments, but it's made for like your jewelry or craft stuff. Seen it on HSN.com. Thanks for the giveaway. I love that card. I have a new great grandson coming in Sept. and would love to make that for him. How cute. Thanks for sharing. Thanks for the tip. I have a 3 drawer rolling cart where I store all my punches. I like the idea of punching an index of all your punches. I'm definitely to use that idea. I think I'll also put the "punched out" pieces on the drawer front so I can find the punch quickly. LOVE the tip about having all of them punched out already! You are so smart!! I have my punched stored in clear shoe orgaizers on my 2 doors but I am out growing that so now need to decide what to do! Thanks for sharing and the chance to win!! PS DAD loved his card. It is one of his favorites!! Thanks again for sending it! You made his day! I love the idea of the templates. Right now I store all my punches in an iris cart, but not too organized right now. I am hoping to find new ideas that I can use when I creat my craft room this summer. Yippee!! Thanks for sharing your tips and the chance to win. I only buy punches that close like this...they take up less space. I store them in plastic bins. Emma, thanks for the idea for the using templates! I need to do that. Right now my stamps are stored in a basket but hard to find what I'm looking for. I think I will try the plastic container like you used because it is so much easier to find the one you want to use. Emma, what a great idea!! I store the punches I have in a basket. I do not really have a lot of punches so the little basket I have works great for me. By the way, your card is sooo adorable!! I store my punches in a wooden dresser drawer. I like the punch samples you have, that is a great way to audition the punches. 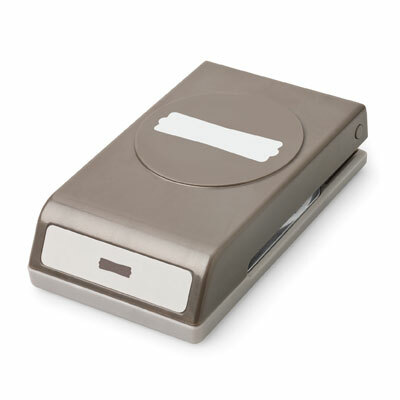 The modern label punch looks like a great fit for your stamp collection. Thank you for the tip and I love your card, I don't have to many punches but the ones I have I keep them in a plastic container that I got from Michaels!! I store my punches in a few draws. I have to reorganize and find a better system of storing them but this is what I do for now. Well right now they are in 2 drawers and the one's I don't use to often are in a box. Thanks for the chance to win the punch. Love this card andbthebTim Holtz facets are really neat. Thanks for yor punch tip-I really like the idea of punching them on card stock so you can see what you have and how it fits. I have different storage units for my punches. Cute 3 tier shabby chic tier for my MS punches, a basket for some of the large ones, an over the door shoe hanger and I put my EK Success punches in a hanging cosmetic organizer. I keep buying more and am running out of places to store them but would still love to win this label punch! TFS. This is the cutest card ever! I love the way it turned out and I love the little charm its very sweet! I need to get some punches. TFS! I store my punches in an clear see-thru over the door shoe holder. For the ones that will fit, I use the rails from Ikea because they stay up there without falling through. I also love the baskets from this system, for ribbon!!! Wow! Emma I have been missing a lot. Something new i guess we learn things everyday. thanks a bunch. Hi Emma thanks for the punch tip. As ALWAYS great video. My husband put several of the round curtain rods on the wall that's closest to my craft room desk. It's reinforced with brackets for support. All of my punches are at arms reach. I store my punches in the over the door shoe holder. I love your tip about having a piece of paper with all the punches on it to find the one you need. I'm going to go up to my room and do that today! Great card idea. Punch storage is a problem I have them everywhere My small ones are in photo boxes not easy to finds Larger ones are in plastic storage boxes some with deviders others not, i can at least see them. Love the templete idea very useful, will have to try that out. Love you Friday tips keep them coming. Hi Emma! Thanks for the storage and organization ideas. I don't have any great tips for you as I keep my punches in a bucket on a shelf in my ikea storage wall unit. It is super easy to just grab the bucket and bring it to my work area for using and then put it back : ) I love the tip and am hoping to win the punch! Oh BTW I love all your videos they keep me inspired! Loving your "tip of the day"! I store my punches in a 6 drawer unit that I got at IKEA. Easy to get in and out....love it. I love your Friday Tips...also love your blog...check in daily...I have an antique 30 drawer curio file that I keep my punches in organized by type, brand, etc. It is real handy for me...(I don't have all 30 drawers filled with punches (LOL)! Fantastic idea Emma!!! I am going to do this straight away! I store my punches in a clear shoe organiser and a desk drawer. (The SU ones are in the drawer). This will make life so much easier!!! Thanks for the great tip my friend! I don't hardly have any punches so I just through them in a storage container, all 8 of them or so. Easy peasy but I love all of the ideas from some of the comments as my collection grows! I store my good punches in a large art bin. They work wonderfully. My oh not so good punches - or ones my daughter plays with are stored simply in a drawer. Thanks Emma. Love your tips and tricks. Cute card! I store my punches in a hanging shoe organizer on the back of a door. The pockets are clear, so I can see all the punches. Thanks for a chance to win! jlaudano at yahoo dot com. I store my miscellaneous punches same as you but only have one SU punch so far. I store my MS punches in a 12 x 12 drawer closer to my work station. Would love to win that punch. Great card! I really need a new idea to store my punches. Right now they are just thrown in a plastic bin. I don't use them near enough. Thanks for the idea with the pre-punched guides. OMG Emma you are posting the inside of the cards that you create. Wonderful, I love it. I thought that it would be a good idea. I store my punches in a drawer. I also have the smaller ones in a softsided pencil case which zips open so I can easily see all the punches. My edge punches are stored in a Creative Memories zip bag which works very well for them and I can easily identify them. Hi Miss Emma! I store the bulk of my punches in 2 hanging shoe racks that have swivel hangers on them. I bought them to originally hang in the closet of my craft room, but they're too heavy when they're full. Now they hang on an over the door hook. I would LOVE to win this punch!!! I've had it on my Stampin' Up wish list forever!! Thanks for the opportunity! Happy crafting!! Thanks for another great tip Emma! I don't have a whole buncha punches so I store mine in a couple of those craft keeper boxes (the 12 x 12 size ones with lids). They came in a little cart to keep a few of those in, so it works for me! Thanks for the chance to win that punch. It's on my wish list. I store my punches like you do and I have a seperate one for my stampin up ones. Thanks Emma. Loved watching your tip video!!! SUper duper sweet card...love the background...its awesome!!! And the charm you made is so stinkin cute. I love the idea of punching them ahead of time...clever idea!!! Wow. What a nice give away?!! I don't really have special way to store all my punches because I have limited space in my house. I store all my punches in two plastic drawers (18"Wx12"Hx20"D) next to my Spellbinder dies and Sizzix dies. Sadly, I only have like 4 punches and they get crammed in a drawer! ugh!! Love the idea of keeping them on a plastic bin! I only have a total of 3 punches and currently keep them in a photo storage box - the ones they sold at Micheals, AC Moore, etc for 5 for $10 or so. I'd love to add the Modern Punch to my small collection. Thanks for the chance to win! Love the template idea! For now, I just keep mine in a box. Would like to get the towels rods or the ones from Ikea to put on the wall and hand them there. Right now my punches are in drawers by shape--all circles together etc. Thanks for the chance to win! I store my punches all tossed together in a bin. I'll have to organize the better now that I have your tip! Thanks for this new segment on your blog / YouTube. I'll be keeping my eyes open for more tips! I would love to win that punch! I keep my punches in drawers. I don't use some of them as much as I used to since I really got into using my Cricut, so I make sure to go through them every now and than and clean out the ones not getting used. Great video. Thanks! I store my punches in a plastic tub now, but once I get my crafting area cleaned out and set up, I am planning to use a shoe organizer that hangs up. Saw it somewhere and looks like a great idea. How awesome are you!! I don't own very many punches. In fact I have less than 10 so I store them on the shelf. I'll stack them if they are stackable and they are easy to access, too! Thanks for the opp!